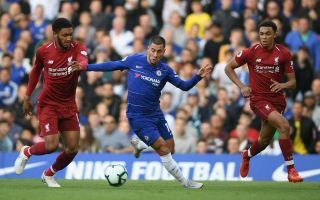 Chelsea star Eden Hazard has surprisingly admitted to his love for Liverpool’s stadium Anfield as he relived his goal against the Reds there earlier this season. The Belgian danced through the Liverpool defence to score a stunning winner in the Carabao Cup a few months back, and he rates it as one of his best goals. But Hazard also admitted that the goal coming against such a big club made a difference, as he praised Liverpool and the atmosphere in their ground. ‘I love Anfield. The stadium, the pitch, the atmosphere. I love to play there,’ the 28-year-old told HLN. ‘I have already scored several goals at Anfield – always against Simon (Mignolet), sorry, but this one was worth it. ‘One of my most beautiful goals ever. It had everything. With Hazard’s contract nearing expiry, it won’t be too long before there’s a real risk of him leaving Stamford Bridge on a free transfer or a reduced fee. Liverpool could perhaps do well to pay attention to these comments and try to also lure him to Merseyside with the promise of playing in an exciting attack-minded team that looks to be really going places under Jurgen Klopp.